Aroma Thyme Bistro is an eco-conscious foodie oasis on a quiet street in downtown Ellenville. 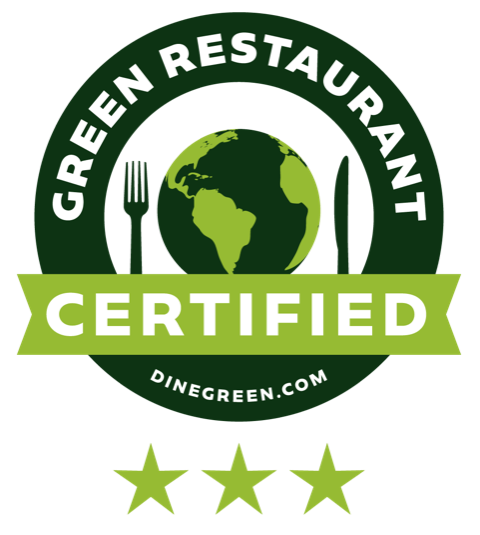 The restaurant is “certified green” by the Green Restaurant Association, and Aroma Thyme’s owner and chef Marcus Guiliano has been an advocate for healthy, sustainable, local food since the place opened in 2003. He calls his style “eco-lectic,” a combination of eco-green business practices and eclectic gourmet cuisine. The dining room has a cozy, tavern-like atmosphere that feels understated compared to their extensive gourmet menu. Page after page offers a dizzying array of organic fair, culinary delicacies and specials — with plenty of offerings for meat lovers, vegetarians, gluten-free and vegans alike. My husband and I recently took our two children there for a quiet, hearty Sunday lunch, and we were not disappointed. The children’s menu contained the usual fare — macaroni and cheese, hamburgers, buttered noodles — but with healthier twists like grilled chicken instead of chicken fingers, and yummy garlic broccoli as a side. Appetizer: To start, we ordered the Great Hill raw blue cheese with roasted apples, smothered in a bacon maple glaze, and a generous helping of cumin poppadum (an Indian lentil flatbread) with cilantro pesto. The cheese is made from non-homogenized, raw milk, gives it a rich, smooth flavor, and the bacon maple glaze was a perfect complement. The kids love poppadum, so they happily munched away as they waited for their entrées to arrive. Entreé: My husband stuck to his standard order of a bacon cheeseburger, but there was nothing standard about it. The half-pound burger was made from the Japanese breed of Akaushi beef. The bacon was “nitrate-free and humanely raised” and the cheese was high-quality Vermont cheddar — all served on an organic sprouted whole grain roll. Roasted Yukon potatoes and sautéed vegetables came on the side. I decided to go vegan and ordered the roasted portabella with organic mashed sweet potato and sautéed greens. The large helping of portabella was drizzled with vincotto, a thick, sweet vinegar gravy made from grapes – and the flavors were a perfect combination. I loved this dish, and was impressed that a vegan option could leave my tastebuds so delighted and my stomach fully satiated. Dessert: We settled on the organic bananas sautéed in organic maple syrup, served with Adirondack Creamery Vanilla Ice Cream, which was a big hit with the whole family. However, the gluten-free chocolate brownie was the real crowd pleaser — rich, delicious and devoured by us all. Aroma Thyme is the best kind of kid-friendly — healthy, organic, local menu options that still appeal to even the pickiest palate. And best of all, kids eat free on Tuesdays. As for the grownups, they have an award-winning wine list and a selection of over 200 beers. If you’re looking for a fun date night, they feature regular jazz nights, open-mic nights and wine and cheese tastings. Katy Weber is the editor of Hudson Valley Parent.